MPPGCL Recruitment 2019: Madhya Pradesh Power Generating Company Ltd (MPPGCL) is a company of Madhya Pradesh Government engaged in the generation of electricity in the state of Madhya Pradesh. Currently, according to recent sources, MPPGCL has released 14 vacancies(Tentative) for the MPPGCL Medical Officer Post. Hence, this is a great opportunity for the eagerly waiting candidates who want to work in the Government of Maharashtra. Kindly follow our page to be updated about all the latest, recent & also ongoing Govt Jobs in Madhya Pradesh. The initial date to fill in the online application was 15th March 2019 & the last date of submitting the online application is 14th April 2019. Also, note that the vacancies available are tentative & the MPPGCL Recruitment Board might change the number of vacancies according to the needs of the company. MPPGCL Recruitment Board has released notifications regarding Madhya Pradesh Medical Officer Notifications & also MPPGCL Medical Officer Vacancies. We also provide latest MPPGCL Syllabus in addition to the Exam Pattern to provide proper guidance to the candidates who are working hard to secure Govt Jobs in Madhya Pradesh. We request all job seekers & aspirants to kindly refer to the information displayed in the above table before applying for the MPPGCL Medical Officer Post. Also, note that only eligible candidates can apply for the job. Refer to the table given below to know about the Eligibility Criteria. For furthermore details/queries visit the MPPGCL official website. Candidates must have an M.B.B.S Degree recognized by the Medical Council of India. For Male Candidates (Applicants having Domicile of MP): 21 -40 years. For All Applicants of States other than MP: 21 -28 years. Age Relaxation of 5 years for SC/ST/OBC/Women candidates of MP. Candidates will be recruited on the basis of an interview. The pay scale varies from Rs. 56,100 -Rs. 1,77,500. Step 1 – First, log in to the MPPGCL official website. Step 2 – Next, go to the homepage & select the appropriate post. Step 3 – Read all the instructions carefully & click on “Apply Online”. Step 4 – Fill in the correct details, upload photo & signature & pay the application fee. 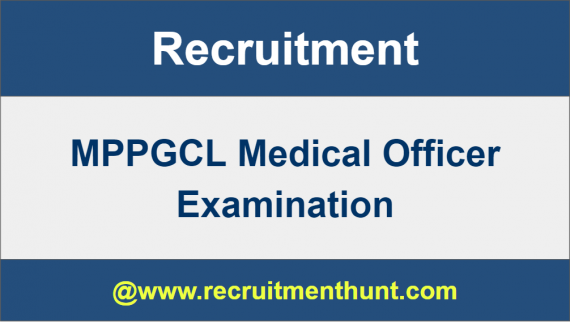 Finally, all the candidates can check the MPPGCL Medical Officer Recruitment Notifications here. Hence, applicants can furthermore, make their preparation easier by following the MPPGCL Medical Officer Previous Years Question Paper. Therefore, download MPPGCL MO Exam Patterns along with MPPGCL Medical Officer Previous Years Question Paper 2019 on this article. Also, for more State and Central Government job updates do subscribe to our site Recruitment Hunt.